Most people know that Nerf has a great range of different types of blasters that shoot foam darts and balls. But if you’re looking for water guns, Nerf has got your back too with their popular Super Soakers. We’ve had a look at some of the best Nerf Super Soakers available today and have selected our personal top 6 for you to consider. The original Super Soaker was invented in 1982 by Lonnie Johnson, a former Air Force and NASA engineer. It took seven more years before the revolutionary water gun was finally brought to market by toy company Larami as the Power Drencher. Sales figures for this brand new water pistol were initially somewhat disappointing, but after a name change and extra marketing power, the Super Soaker became a huge commercial success in 1991 when 20 million water guns were sold. >> Check out our list of favorite Nerf blasters available today. In 1995, Hasbro (owner of the Nerf brand) acquired Larami and became the owner of the popular Super Soaker brand. Before that time, Lonnie Johnson had already filed several patents around the technology behind the water blaster. It is believed by many that Lonnie Johnson’s technological ideas formed the foundation of what later became the Nerf gun. There have been quite a few different Nerf Super Soaker models released in recent years, but the following six are our favorite ones. 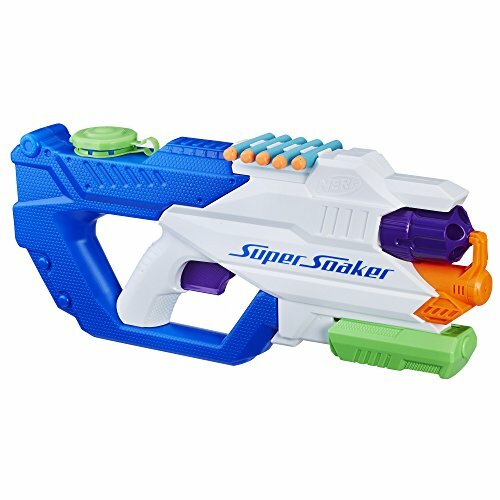 While the Nerf Super Soaker Floodinator is essentially a very basic water gun, its huge capacity of 2 liters (70 ounces) is what makes this blaster so awesome. No bells and whistles, just a simple single stream water gun that performs really well. 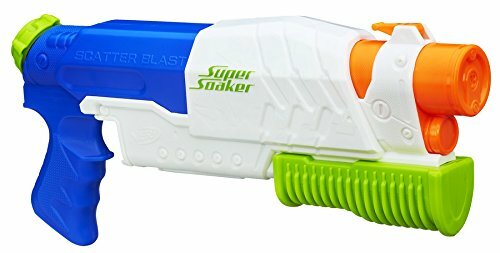 As with most other Nerf Super Soakers, the Floodinator fires water by manually pushing and pulling a pump underneath the blaster. The advertised firing range is 38 feet which is very decent. 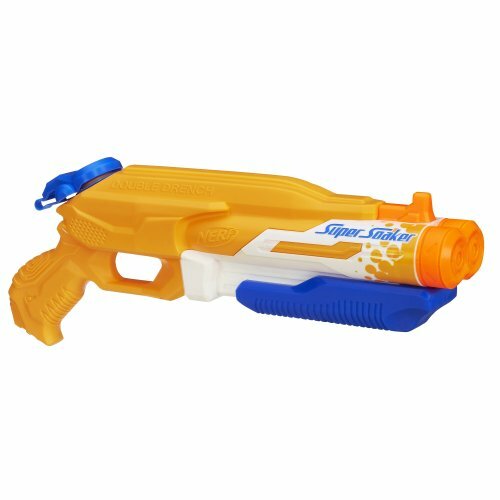 The Nerf Super Soaker Dartfire is the odd one out in this list of best Nerf Super Soakers. Why? Weirdly enough, the DartFire, as the name suggests, is a Super Soaker that also fires darts. We’re really not sure why Nerf decided to design a blaster that is a both a water gun and a Nerf gun, but we like it. It comes packaged with 5 Nerf Elite Darts that you can load in a five-dart rotating cylinder located above the main barrel. The blaster fires one one dart by pulling the firing trigger. The cap of the water reservoir sits on top of the blaster. It can hold just over one liter of water and fires up to 38 feet away by manually pushing and pulling the pump. 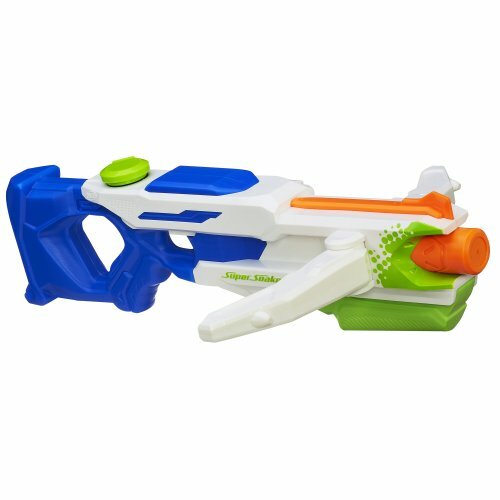 The Nerf Super Soaker Tri Strike Crossbow stands out as a water gun because it can fire a powerful single stream, and a triple stream with the bow arms deployed. The main water stream comes from the nozzle at the front of the blaster. The other two streams are fired from nozzles on the deployable crossbow arms. The crossbow arms can easily be deployed by pressing a button located under the right crossbow arm. The Tri Strike Crossbow can holds up to 40 ounces of water and fires streams up to 38 feet away with a manual pump action. The exciting Double Drench is named that way because it can fire from two barrels at the same time. Each barrel has three nozzles so in total you would be firing six water streams at your poor enemies. The blaster holds almost one liter of water via an opening on top of the gun. Firing is easy with a manual pump action. The Scatter Blast is able to fire five water streams simultaneously up to 34 feet away with a simple manual pump movement. You can fill up the reservoir of Scatter Blast with up to 23 ounces (650 ml) of water via an opening at the back. 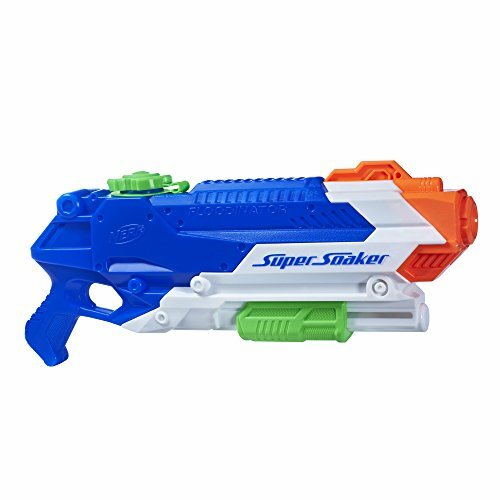 The Nerf Super Soaker Breach Blast is very similar to the Floodinator, both in design as well as in performance. 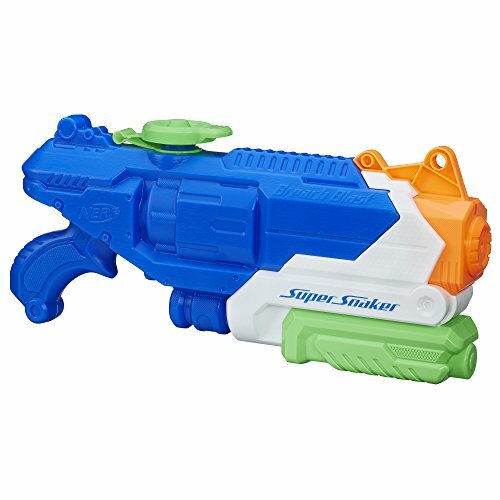 It’s a classic pump action Super Soaker that fires a single stream of water up to 38 feet away. The Breach Blast can hold up to 50 ounces of water in its reservoir that can be opened and closed with a twist cap.